A couple months ago, I was invited to speak at Virtual JUG - an online-only Java User Group organized by the ZeroTurnaround folks. They chose my Comparing JVM Web Frameworks presentation and we agreed I'd speak yesterday morning. They used a combination of Google Hangouts, live streaming on YouTube and IRC to facilitate the meeting. It all went pretty smoothly and produced a comfortable speaking environment. To practice for vJUG, I delivered the same talk on Tuesday night at the Denver Open Source Users Group. The last time I delivered this talk was at Devoxx France in March 2013. I didn't change any of the format this time, keeping with referencing the Paradox of Choice and encouraging people to define constraints to help them make their decision. I did add a few new slides regarding RebelLabs' Curious Coder’s Java Web Frameworks Comparison: Spring MVC, Grails, Vaadin, GWT, Wicket, Play, Struts and JSF and The 2014 Decision Maker’s Guide to Java Web Frameworks. You can watch the recording on YouTube or click play in the embedded video below. You can also quickly browse the slide deck below, download the PDF or view it on SlideShare. Thanks to all the folks who attended these talks. And thanks to @dosug and @virtualjug for giving me the opportunity to speak. Please advice how can one join this vJUG? Go to http://www.meetup.com/virtualJUG/ and click the "Join Us" button. Matt, thanks for this vJUG session. I've been following this talk for years and see transformation, which is obviously. I did see Play vs Grails (you and James). But, could you please provide your current opinionated vision what framework (play vs grails) is the better and why? I'm curious because Play isn't servlet-based and some customers might worry about this. Orest - I believe Play and Grails are both good frameworks. If you look at Indeed's Job Trends, it looks like Play is more popular than Grails. I think there's some really cool things coming with Grails 3.0 (esp. basing everything on Spring Boot), so that could boost it's popularity again. However, Pivotal pulling its funding probably won't help. Personally, I've enjoyed Spring Boot as a webapp framework most recently. However, all my clients for the last year have needed an API, not a traditional server-side MVC framework. I've used Spring Boot to develop these APIs. In some cases, I've helped them develop iOS apps to talk to these APIs. In others, I've written an AngularJS front end. 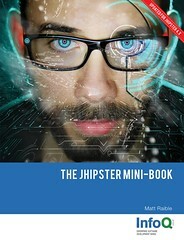 Because I like AngularJS so much for webapps, I've been more attracted to JHipster recently. On a project I left last month, they decided to use Play for their API and I supported their decision. With microservices being all the rage these days, the lack of a servlet-based framework (or even an app server) doesn't seem to bother most of my clients. Those indeed job trend stats are nonsense to be honest. if you read those stats you can see Play was even bigger than Grails is now in 2006, when neither framework existed. How many job postings have the words "Play" and "Framework" in them, probably a great deal more than Grails even if they are largely irrelevant.